Thank you for your interest in our film. Due to different distribution contracts and licensing, DVDs are available from different sources. *Canadian customers see order button above. To order by check or money order, please send payment along with your name, address, and email and specifics of order. Add shipping and tax as outlined above. Your check or money order payable to “Green Belt Film Project” must be issued in U.S. dollars. Call 802-257-0743 if you have questions. 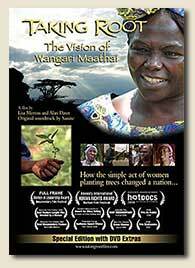 DVD currently offered in English – please see “International Edition DVDs” for other languages.